Bifold doors are magic in small homes and units for concealing those not-so-attractive work places such as laundries, home offices and sinks. A metal track is installed along the head of the opening you wish to close off. 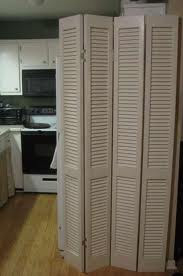 Smaller than conventional-width doors-louvered, flush or frames and panelled- are suspended from this track and like a piano accordion, they open out or fold up. But unlike a conventional door, they only take up half the room. 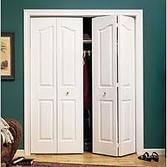 You can cover openings from 915mm to 2400mm using doors 19x35mm thick. The bottom pivot off which the door turns has to be positioned exactly under the top corner of the supporting door to ensure a smooth folding action. 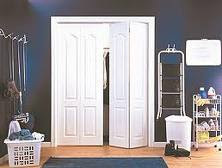 Also, if you hinge the doors by fastening the hinges to the edge of the door rather than by recessing them, you will have the necessary clearance to guarantee easy opening. A bifold kit usually includes the track, top brackets, bottom pivots, hinges and all the fastenings. The instructions enclosed must be read before beginning the project. How bifolds work? The two outer edges of the hinged pair slide together along the track. Well, are you interested to install it at your home? we used to have bi-fold doors from our previous house, but I don't like them. It's very annoying. You are my hero. I too love bifold doors. But I usually love before and afters too. Especially when contact paper or crocheting is involved. This is wonderful. UPVC does not rot, needs little attention so is highly cost effective long term. Research shows that cost savings are up to 35% on a UPVC bifold door compared to timber and aluminium.